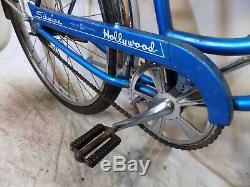 1970 SCHWINN HOLLYWOOD LADIES 24 VINTAGE CRUISER BICYCLE CORVETTE AMERICAN S7! 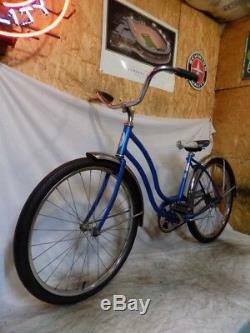 Here is an original May 1970 VINTAGE (The serial number is EF) HARD to find ladies SCHWINN HOLLYWOOD beach cruiser bicycle with 24 wheels. 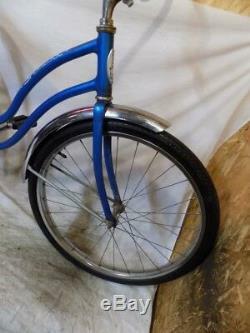 It is in the original and very appealing radiant blue colored factory paint. If you like UNIQUE unrestored original bikes, this may be a great bike for you. With the insanely high price of gas (and the economy being bad) now is the time to ride a cool vintage bike! 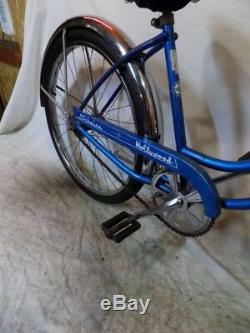 This bike has a cool ladies cruiser style frame and forks with original paint and decals, original Schwinn chainguard, (has a fresh decal) Schwinn cruiser style seat, wide cruiser handlebars, Schwinn hand grips, full fenders, (have dents) Schwinn pedals, and more! I believe this bike to be basically all original parts from when it was new. (see pics and be your own judge) This bike has spent the last couple of decades hidden away inside a semi trailer here in Wisconsin. It cannot wait to be enjoyed and in the sunlight once again! The tires are 24x1 3/4. 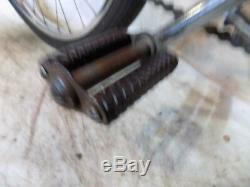 They are vintage SCHWINN tires and do hold air. 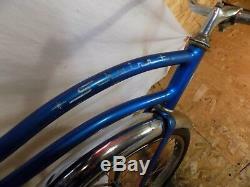 The bike has factory chrome Schwinn S-7 rims front and rear with a Bendix rear hub. The bike is an original SINGLE SPEED with coaster brakes. (pedal slightly backwards to stop the bike) DIMENSIONS This is the perfect size bike for a shorter rider or younger person that would enjoy a vintage bicycle. The distance from the floor to the top of the seat post clamp is approx 25 1/2. The distance from the center of the crank to the top of the seat post clamp is approx 16 1/2. The center of the handlebar stem to the center of the seat post is approx 20 1/2. The bike will accommodate most any rider comfortably. The seat height is easy to adjust. NOTED FLAWS I got this one just like you see it. I LOVE original paint bikes! The paint looks ok for a 55+ year old bike! HAPPY that it is still original paint! The chrome is shiney but is not perfect show quality. Both wheels have a slight wobble when you spin them. (most every used bike out there seems to). This bike is SO cool and cant wait to be enjoyed once again! IF you EVER think you would enjoy a bike like this, DO NOT MISS OUT! 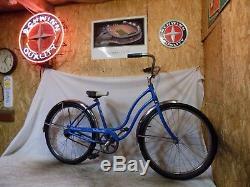 I love the middleweight series of Schwinn bikes of this era! (Jaguar, American, Panther, Skipper, Hollywood, Tiger, Speedster, etc). 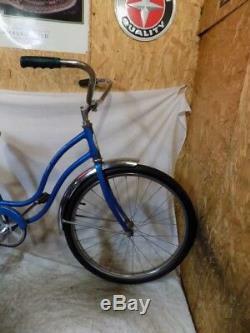 This appears to be a fairly nice original unmolested bicycle unless otherwise noted. 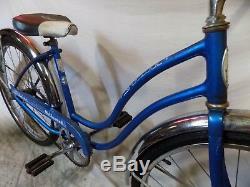 A great bike to ride on relaxing days through the park or to the beach. Also would be a nice item to display in a shop, restaurant, rec room, sports bar, etc. Stand out from the crowd and be the envy of people who see you riding by. People will enjoy seeing you on your vintage bike! 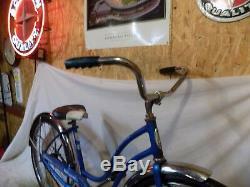 A great classic bike at a great price Why not ride a bike? If you are looking for a fun bike to ride and enjoy this may be it! 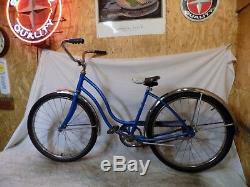 A nice bike to cruise the beach or your local park! I try to be as honest as I can and disclose anything I know about the bike. I want you to be excited about your new bike and hope you really enjoy your new vintage ride for years to come. We try to package well so the bike arrives to you in the same condition as it left us. Fed Ex just increased the rates. This is a 10+ day service and includes packing. I always try to keep things as reasonable as I can. 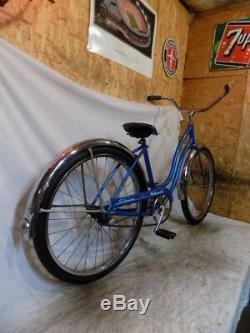 The item "1970 SCHWINN HOLLYWOOD LADIES 24 VINTAGE CRUISER BICYCLE CORVETTE AMERICAN S7" is in sale since Thursday, January 17, 2019.